Book Plug What did free-marketeer Larry O’Donnell tell the Prez? About three people I know have read my entire book “Dogging Steinbeck,” which is for sale on Amazon.com as an ebook for a lousy $6.99 but is still in process of becoming a print-on-demand book. 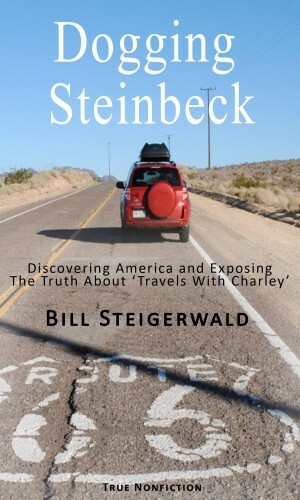 “Dogging Steinbeck” makes a fine (i.e., cheap) Christmas present for anyone who loves Steinbeck or hates Steinbeck; who loves “Travels With Charley” or hates it; who prefers American road books that aren’t written by New York or Europeans liberals; or who prefers truth and fact in nonfiction books rather than fibs and fiction. Since I didn’t have an editor or copy editor to save my from my imperfect and mad self, my unpaid, invaluable readers have been invaluable. They caught many little mistakes of fact, typos or dumb writing, which I have fixed thanks to Amazon’s Kindle Direct Publishing program that allows writers to easily add material or fix mistakes. My friend Jim Dourgarian, aka Bookman, who’s a major West Coast book collector, a Steinbeck expert and an ex-newspaperman, saved me from my worst embarrassment. I had at least 20 semicolons sprinkled throughout my book. For someone who once told his one and only class of college students to never, ever, use a semicolon, as I did, it was shameful. Of course, neither I nor my marketing director Bill Steigerwald will ever use another; again. You can add one more to the list of persons who read your ebook on the Steinbeck fraud. I don’t think Steinbeck was very sociable that he had to make up encounters of the n-th kind in order to save his book. This makes him a writer of monologues and shaping the world in his own character without possible contradiction.Too easy to prove you’re right. It’s a offence of the intellect of every US-citizen.Take that Steinbeck! I’m a pensioner from Belgium and last October my wife and I made a leaf peeping trip of 4 weeks in New England. My wife was several times in the US but it was my first encounter with the New World. We rode some 2000 miles on roads, I expected to be a little better. 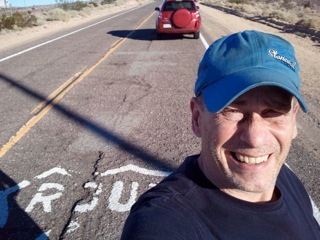 In Western Europe the roads are better but your roads are not so bad as in Eastern Europe. The Ukraine and Rumania are known for 50% holes, 50% road. I was astonished that the electricity wires were still in the air. That’s something typical for Eastern Europe over here. Electricity wires are very vulnerable as we noticed the tree branches that would possibly cut the wires in a storm were not removed from above. I hope people buy generators for their deep freeze. We followed the Obama-Romney debates on television in our various hotels, talked to people about the upcoming election and I was astonished that people expect so much of politicians as if politicians had some real power over the economy. They expect jobs from politicians. Basically it’s asking for a communist environment where politicians do just that : give everyone a job, not well paid, but enough to get some sort of quiet living. The communist dream is very alive in the US, but it has not recognized as such. “The anonymous communism of the US.” Could be a title of a book. Politicians can push some buttons in the realm of the economy but it always has side effects that cannot always be predicted. The Iron Lady in the UK had only one economic guideline: what’s good for the English pound is good for the nation and she kept pushing that button for over 10 years and now she’s praised into heaven for something that widened the gap between rich and poor so much it’s nearly impossible to stop. Your book was not so easy to read for me as it is written for compatriots who know Jim Crow and other phenomena which were not known to me. I came to read your book after reading the Geert Mak book in Dutch. I think he followed you and read your blog on the way. Mak explains a lot of the American history in his book, which made your book easier to read for me. I never read a book from John Steinbeck and I don’t think I will. On our trip we encountered Mark Twain and he is more of a free spirit, I found. I think I’m going to read something about him. We also visited some Norman Rockwell musea and we are now huge fans of this formidable person. Thanks for writing your book and we want you to know we share your pain in the drama in Newtown. We hope something is done to make this, not impossible ( I don’t think it can be done), but nearly impossible.